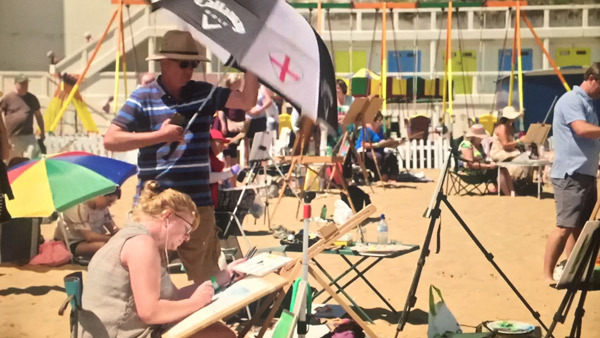 The heat for Episode 5 of the Landscape Artist of the Year 2018 was held at Broadstairs Beach in Kent. This time there was no rain. Instead it was a brilliant sunny day with lots and lots of people in the landscape. It was broadcast on Tuesday night - and this is my review. 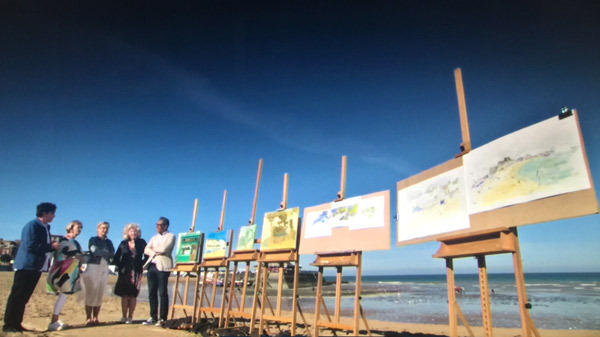 This is the Heat that I very nearly visited (see Heats of Sky Arts Landscape Artist of the Year 2018) - but then remembered I don't do too well out in the sun all day and have got arthritis and joints that require a flat stable surface - so a sandy beach wasn't a great idea! 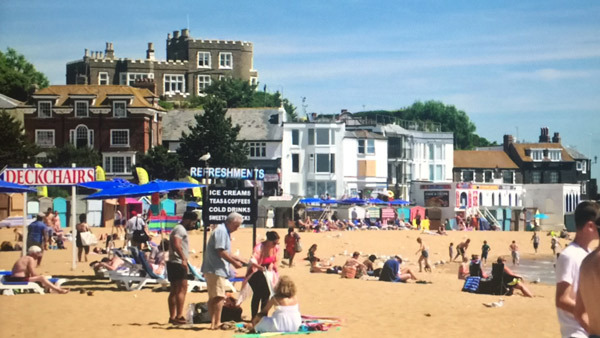 A quintessentially British beach with beach huts, fish & chips, a rock pool, ice creams and sand castles. Links to websites are embedded in their name and links to their social media sites follow their name. 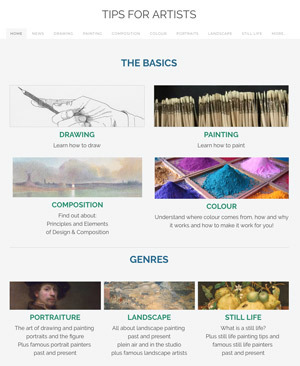 Jen Gash (Facebook | Twitter ) - Jen is from Gloucestershire, has worked as an Occupational Therapists and Coach and recently enrolled for an MA Degree in Fine Art. She is a life-long artist, exploring physical and psychological landscapes. She likes to have several canvases on the go at once and confesses to be better at starting than finishing. Originally a wildcard artist for the very first heat of Landscape Artist of the Year at Trellisick, Cornwell in 2015. Michelle Heron (Facebook | Twitter | Instagram) - born in Norwich in 1980; graduated from the University of Hertfordshire BA Fine Art (Hons) in 2002. Works as a reprographic officer. She says she has always been interested in the spaces that are unused or forgotten and the traces where people have been. 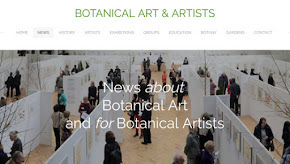 Her paintings have been exhibited at The Mall Galleries, London, The New Art Gallery, Walsall, Hampton Court Palace, London and The Royal Academy, London. In 2016 Michelle’s work was shortlisted for The Lynn ​Painter-Stainers' Prize, The John Ruskin Prize and The National Open Art Competition and in 2017 was selected for the prestigious Royal Academy Summer Exhibition. Jain McKay (Facebook | Twitter) - a printmaker who is not a landscape artist. She lives and works in the Midlands where she also exhibits and teaches art. Her submission was a monochrome print in drypoint. She likes introducing textures into her printing press to make the fine art print more interesting. 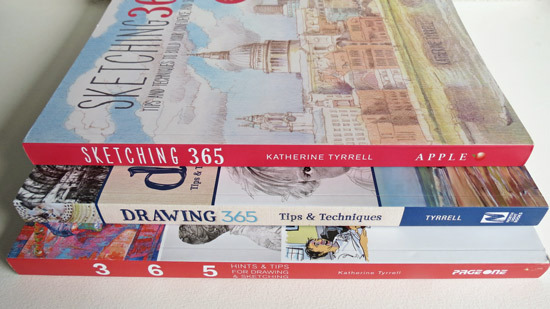 Martin Taylor (Facebook | Twitter) - Michael does photorealist landscapes in oil and sells them for a lot of money! This is his page of hyperrealist landscapes in watercolour. His tree observations take a month to complete. His way of working demonstrates for me why this competition is not best suited to those who take a long time in the studio even if they create impressive landscapes when they do. He has written several articles for The Artist magazine and has also had his paintings featured on the cover. The pods are sheltered and have electricity and you get cups of tea and food etc, whereas as a Wild Card artist you are pretty much on your own. Having now been an actual heat artist, I do feel very privileged. The crew look after you really well and the cuppas are most welcome. Saying that, the painting stays the same. 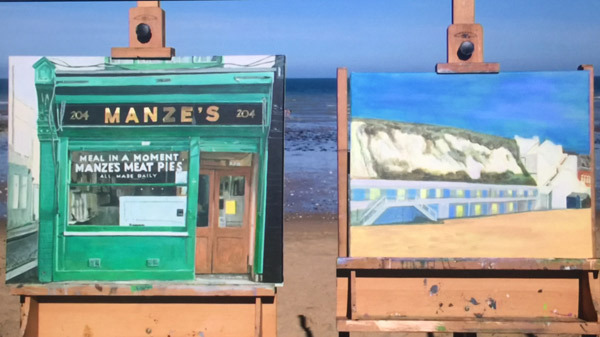 Jen's second post is about My heat at Broadstairs: Sky Landscape Artist of the Year! 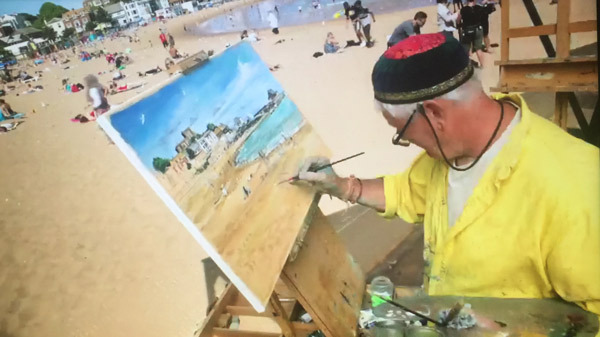 I turned up at Broadstairs earlier this summer with one thing on my mind – to just enjoy the day, make a painting that had legs and not look too daft on telly (first one is easy, second one you can decide, third one… who knows!) Now that isn’t to say that I didn’t prepare for the day. For a non-competitive person, something took over me once I learned I had won a place. 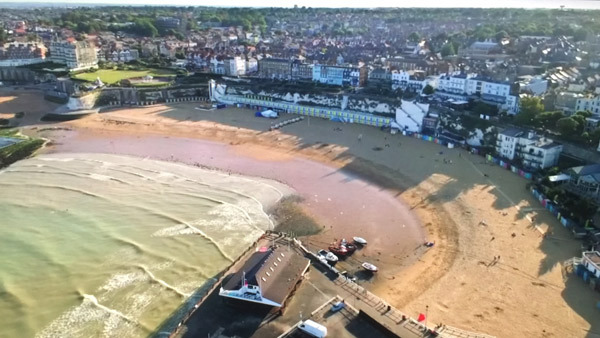 I practiced the whole 4-hour thing, researched Broadstairs and put together a game plan. 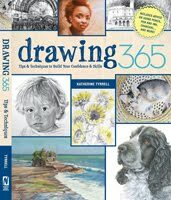 Michelle wrote Sky Arts Landscape Artist of the Year 2018 Episode 5 as her first blog post! It has LOTS of very helpful tips. ​I was approached to apply for the show but dismissed it for months thinking it would be too big a challenge for someone used to painting indoors and taking 2 weeks to complete a painting! But then at the very last moment something made me change my mind and just thought it'll be good exposure and might push me forward. When I found out I was a pod artist I was in a bit of denial. I then began watching the previous series and made notes of the key words the judges were using to give me an idea of the kind of artist that does well. One thing that stood out for me was choosing an idiosyncratic view. This is the story of Jain Mackay's day, why she thinks she was chosen and what went wrong. In my defence I am not a landscape artist, I made one landscape as part of a project, I entered with it because I did think it was quite good and it got me on the show. If It hadn’t been a print I don’t think I would have got on, each program has an alternative to a painter just to make it more interesting. Peter John Robert Thompson - paints bouncy castles and lives in Leicester a- a very long way from the seaside. His very comtemporary urban painting took him some 200 hours to complete. Of the now or of the past? The importance of being true to YOU! The reality is its a technique which is not difficult to learn - but few do. 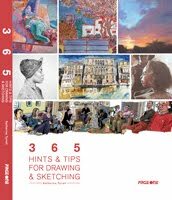 I draw people in interior landscapes and talk about about "Drawing Groups of People" in my book Sketching 365: Build your confidence and skills with a tip a day (2015) - pages 86-87. 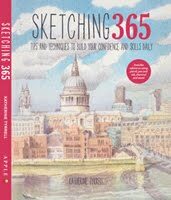 For example, you have to start knowing that people will move and hence you have to keep a sketchbook to cvapture them when you see them and/or draw very fast. Also, all my drawings involving people never have all the people in there at the same time. The number of people for the setting is about right - but people came and went the whole time. I guess the one thing that surprised me somewhat about artists going to a seaside town during a hot summer is that they didn't think about whether or not to practice drawing people before they went. My TIP is to think about the context of the place where your heat is and think about what is likely to be present that might feel alien to you - like people! Could the artists draw/paint people? Did they know how to draw people to scale (or did their style mean this did not matter)? Did they like painting people? Did they want to paint people? Would including people kill their painting? 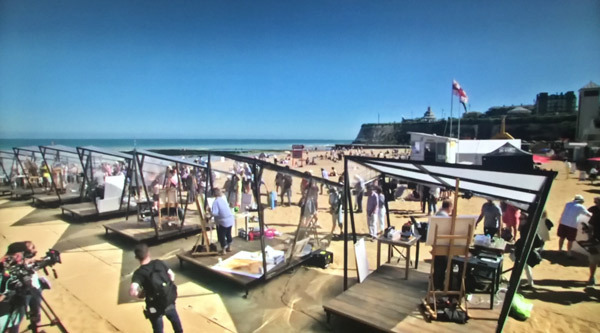 It was very interesting that for a heat located on an incredibly busy beach that two of the shortlisted paintings did NOT include ANY people - but I think I can understand why. Why ruin a painting by including people if they don't interest you and are alien to the way you normally paint and generally you won't be able to do justice to them. If you did it would feel very much like an "own goal" afterwards. Personally I had Stewart down as a 'dead cert' for the shortlist - until I saw his final painting when they were lined up - and realised that his painting had become a sum of two halves. 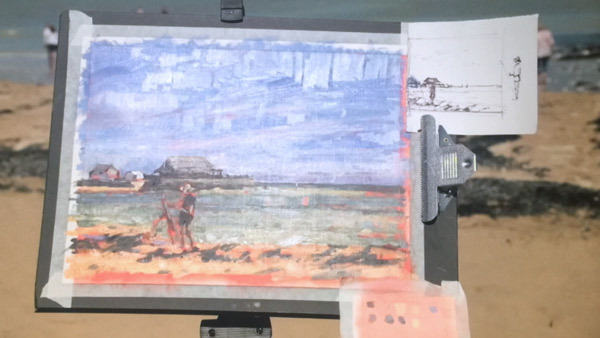 His painting of people on the beach was too gestural - but also very messy and and a little incoherent and the bottom half of the painting simply didn't read anything like as well as the top half and if anything 'fought' and separated itself out rather than unifying the painting. 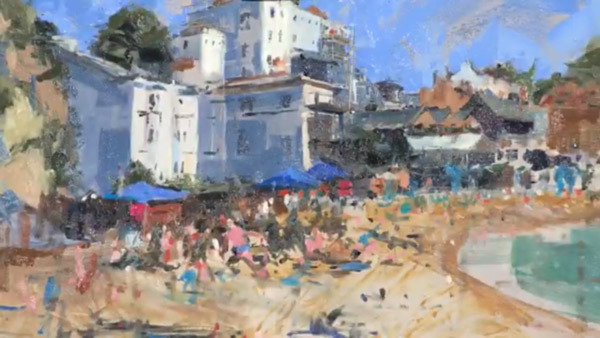 However he's clearly an accomplished oil painter and I still very much liked his idea of providing a counterpoint between the man on the scaffolding working away and the people on the beach stripped off and sunbathing - and I also liked his submission painting. Note: Interestingly I think the era of the painter who can include people in his figurative scenes is coming back. This is maybe a challenge that more people need to get to grips with. I certainly think that this Series ought to confront the notion that landscapes are not all rural/deserted idylls! This was by far the most complex and energetic landscape any of the heats had seen in this series (and maybe the previous three series too!). Judges highlighted that how the artists handled a lot of information relating to a large busy landscape would be one of the critical ides for the day. For me the critical issue is deciding just how much of that complexity to add in - and how much to edit out. 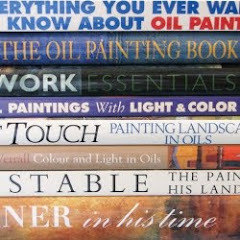 The first rule of being an artist is that you don't have to paint everything! I think those who sat and drew for a while and worked out how to crop the scene down and what to include and what to exclude did better. If you watch it through again, listen out for the discussions and the decision-making which is essentially about editing. I thought Lorna did exceptionally well on this front - although I think that possibly editing out a very bright blue sky might be something she now regrets. I thought she was a strong contender for winning the Heat. 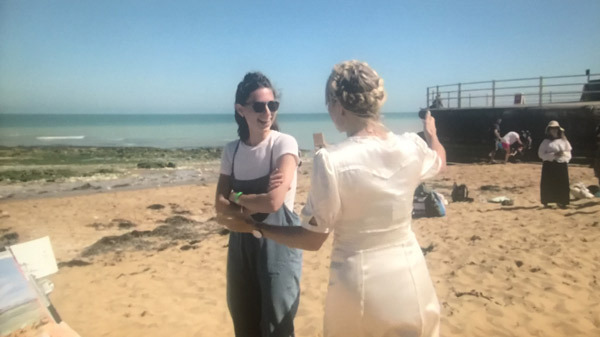 However - and by way of contrast - Martin also edited down the people, but somehow according to the Judges he'd revived the 20s and incorporated some "sweet" elements (white seagulls against a blue background and an idyllic beach scene). Kathleen and Kate don't seem to be the sort of women who like candyfloss - and that was maybe why he did not get shortlisted. More importantly for me, there was a discontinuity between his submission and his heat paintings. One wouldn't have said they were by the same person. I think the decision not to shortlist was maybe an amalgamation of a number of small points. I thought his painting was OK - of its type (it reminded me of the scenes you used to get in railway carriages when I was young) but it didn't wow me. Yellon edited by completely rearranging the landscape into a vertical format. 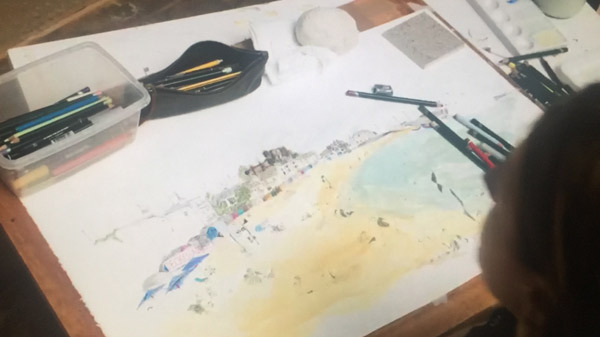 I have a feeling that there there was a sense that it was a really interesting approach and she was to be applauded for having a go (and for coping with painting on flimsy rice paper outside in a strong breeze) but it didn't feel like Broadstairs. The colours felt all wrong - and the paper kept on ripping. There's a very narrow line to be trodden between taking out the unnecessary and changing the sense of the scene. 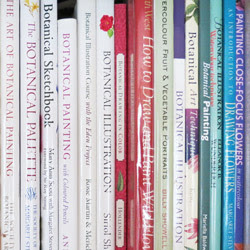 It occurred to me with Lorna's submission that artists need to think hard in terms of the subject they submit - as that might well influence what you get as a scene to paint. There again - they may test you by giving you something completely different! We had two specialists - in shops and trees - and both were challenged by the scene - but in different ways. One of the things that was highlighted was that the judges recognised that for a number of the artists the subject matter and the time constraint were something which really put them outside their comfort zone. 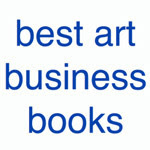 At the same time they respected the fact that some artists resisted the temptation to "do a painting for the competition" but rather chose to be themselves. I rather suspect that a lot of people on Twitter who were being scathing about those shortlisted did not think about the fact the Judges were keen to see how an artist they had chosen chose to represent what they saw - as opposed to producing a rendition of what eveybody watching television last night aw i.e. lots of bright blue sky and lots and lots of bodies on a beach. It was very clear it was late when they got down to viewing the paintings - not least because people were acquiring extra clothing! ....or needed about another four weeks as Michelle herself said! We absolutely know that this is today. So despite the fact she has clearly run out of time, I can clearly see where this painting is headed. I liked Jen's second Heat Painting much more than her first. Probably because I don't get on with fantasy. However I do love colour and I also love colour glazing and scumbling. 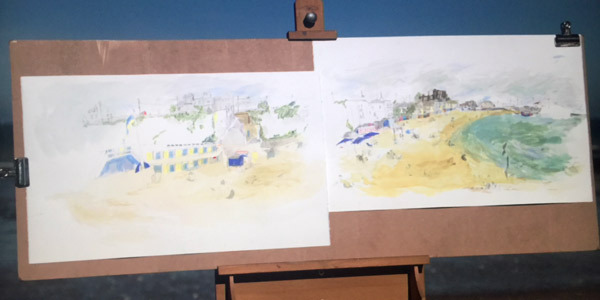 I think maybe the Twitterati did not see or give credit for the very sophisticated use of optical colour and tones - especially on those steps down (on the left) and the beach huts near the bottom) and the flirtation of painting an realistic scene with an abstract edge. "I think what Jen does is she plays to her own strengths, she doesn't just want to paint a pretty picture of the day." "The whole thing has a play of light. She makes me feel as if I'm at Broadstairs 50-60 years ago. It's a really, really compelling bit of narrative." The Judges were impressed by her submission and impressed by her painting the heat. With Lorna, you have someone who understands what to do with all of these characters and all of these people. She understands that you have to distill it to an essence in order to give it that sense of character. Tai I think was sensing it seems very light when in fact the sky was a very solid bright blue. Jen Gash (centre) was just a little bit surprised to win! The winner of Episode 5 was Jen Gash. The Twitterati are not impressed - mainly because it has no people in it! I had her down as a definite shortlist artist - but I was a bit surprised that she won even though I liked her painting a lot. I thought Lorna was looking a very strong contender. However, it did occur to me afterwards that if they chose Lorna, they would have had another artist whose style was not unlike that of Brian in Heat 3 - and they do like to keep the styles different. 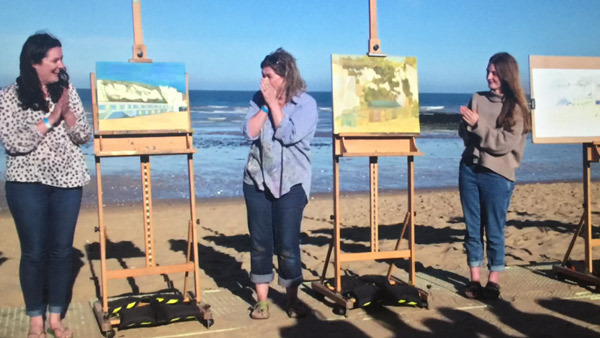 The Wildcard Winner was Rebecca Melzer who painted on of her fellow wildcard artists who was standing at the edge of the sea. I spent ages looking for her art website because there was this other Rebecca Melzer who kept coming up who was all about Opera. It turns out that they are one and the same - and the give away (besides the fact the features seemed to be the same) was the earrings! Rebecca is based in London, Rebecca works as an Opera Director, Movement Director and Movement Teacher. She is also the also Festival Director of Waterperry Opera Festival, an annual festival showcasing opera, music theatre and performance based in Oxfordshire. It just goes to show that those inspired by the arts often don't stop at one! The Heat will be at Inveraray Castle. Hopefully they'll have better weather then the major wash-out experienced at Loch Fyne in Episode 3. 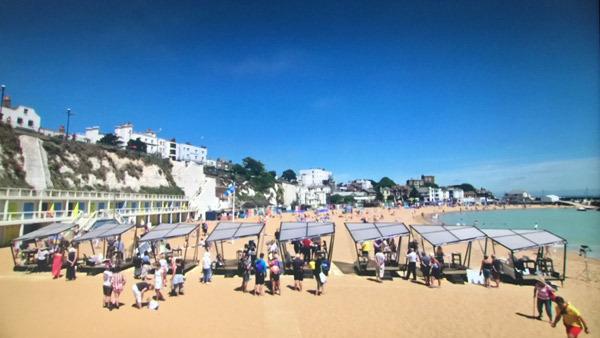 In the meantime - one last look at sunny Broadstairs!